NEW! Mason Jar 16oz Soy Candles. 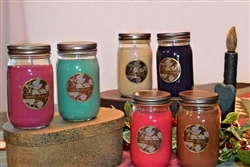 Our most popular candles the 8 oz jelly jar comes in a 6 pack. For only $7.50 per candle, shipping included we will deliver highly scented Papa's Candle Shoppe candles right to your home! Remember this offer comes with FREE PRIORITY SHIPPING and is for a limited time only. Click the Buy Button to pick Your Scents Now! A great way to enjoy the many fragrances of Papa's Candle Shoppe candles. Once you click on the buy button you will be taken to a page to select your 12 scents. Enjoy!